Hendrik van Lint (1684-1763), born in Antwerp, was the son of the painter Pieter van Lint and trained with the battles painter Peter van Bredael (ca. 1629-ca. 1719) in 1697. He settled in Rome around 1710 and joined the Netherlandish confraternity of painters working there, the Schildersbent, from whom he received the nickname 'Studio' for his attention to details. He specialised with success in 'vedute' paintings and Italianate landscapes. 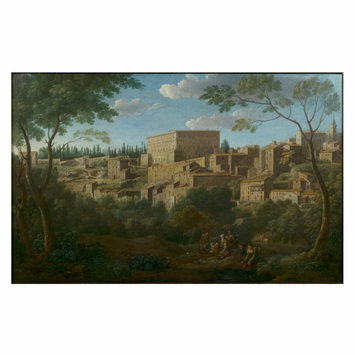 Although the buildings are difficult to identify, the subject matter of this painting is generally accepted as a view of Tivoli, a small city near Rome. 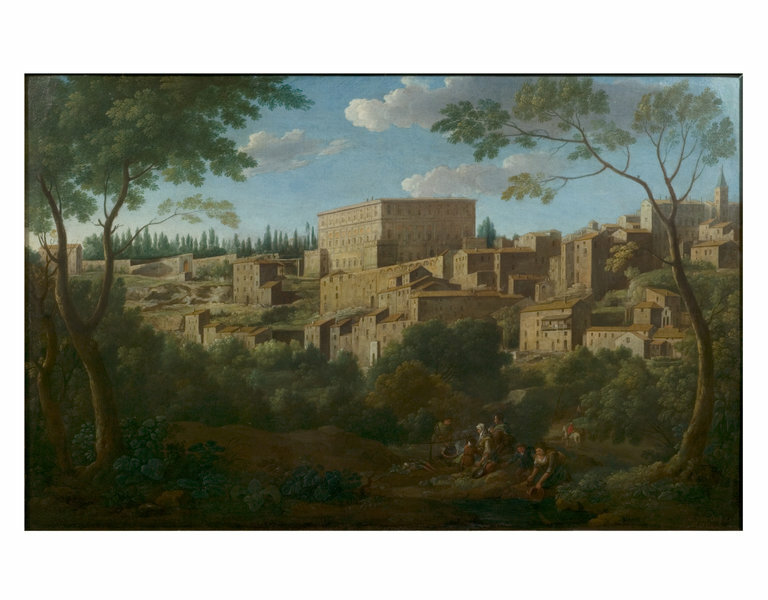 This work is a typical example of van Lint's prolific output of vedute and Italianate landscapes executed in Rome and its surroundings reminiscent of the art of Claude Lorrain. A distant view of a city in a warm golden light on the edge of a wood where some peasants and children are resting. The V&A central inventory indicates that 305-312-1864 were bequeathed by Mrs Duroure and the annual report of the Science and Art Department, which describes briefly the individual works. Historical significance: This painting is a typical example of Hendrik Frans van Lint's 'vedute' paintings inspired by Claude Lorrain, whose compositions he copied and whose style he adapted to 18th-century taste, with paler and clearer tones, prettier colours and sharper handling. 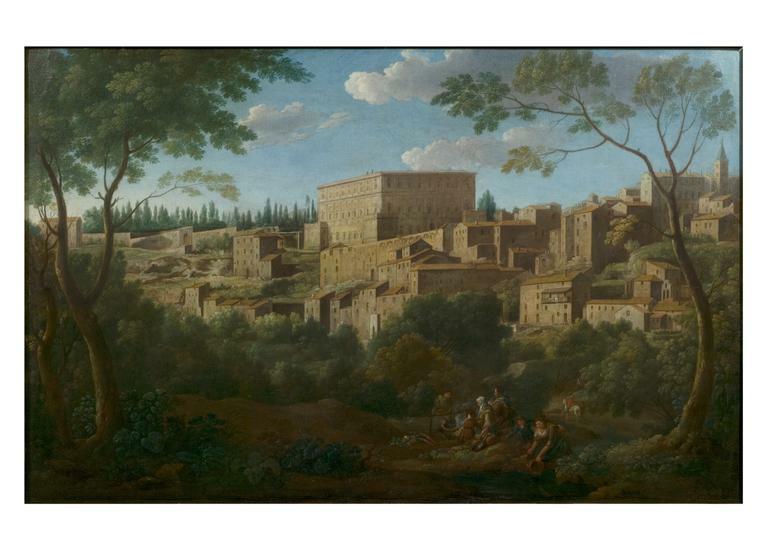 Van Lint painted a number of Italian views of this type: closely related in style and subject matter are a Landscape with an Italian Hill Town in The National Gallery, London and a View of Caprarola, previously in Finarte, Rome. Although it does not seem possible to identify any of the buildings, the traditional identification of the painting as a view of Tivoli is plausible. Dutch and Flemish painters active in Rome between the early 17th and early 18th centuries produced numerous Italianate landscapes representing pastoral subjects bathed in warm southern light, in an Italian, or specifically Roman, setting. At Rome towards the end of the 17th century, Jacob de Heusch (1656-1701), Hendrik Frans van Lint (1684-1763), Jan Frans van Bloemen and, above all, Gaspar van Wittel (Vanvitelli), laid the foundations of a local school of vedutisti. The term veduta ('view' in Italian) signifies a landscape or town view that is largely topographical in conception. Famous Italian exponents of the genre include Giovanni Battista Piranesi (1720-1778) and Antonio Canaletto (1697-1768). An Italianate landscape style indebted to Claude was perpetuated by an international coterie of artists including Carlo Labruzzi (1748-1817), Jacob More (1740-1793), Nicolas-Didier Boguet (1755-1839), Jacob Philipp Hackert (1737-1807), Georg von Dillis (1759-1841) and Franz Kobell (1749-1822). John Constable (1776-1837) was critical of the genre and by the late 19th century Italianate landscapes had lost favour through the rise of Realism and Impressionism. C.M. Kauffmann, Catalogue of Foreign Paintings, I. Before 1800, London: Victoria and Albert Museum, 1973, pp. 171-72, cat. no. 211.